Since Taka and I had our period of sadness we’ve been wandering from sim to sim. We started out with a quarter sim dedicated to steampunk, then I opened another quarter sim for a new garden. This was an ok arrangement for the time being, but we wanted to combine our two quarter sims and get a half sim. We got the current half-sim and immediately setup our steampunk house. I also began work on yet another version of the garden. 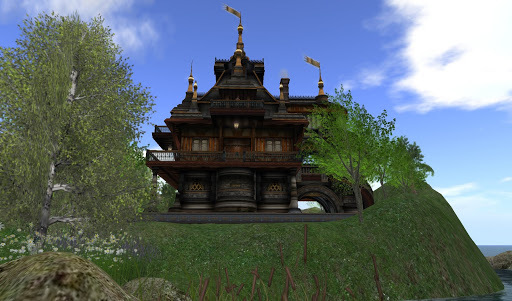 This is our half-sim in the early hours of our ownership; notice the large dark house to the left. 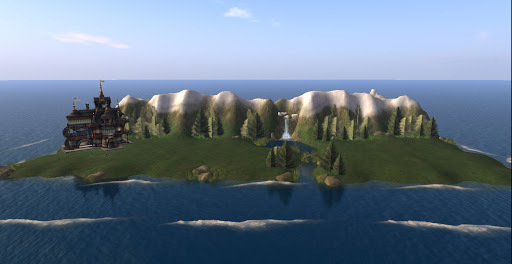 After a little terraforming the house began to fit right in, enclosed in the surrounding mountains and hills, and overlooking the Second Seas. 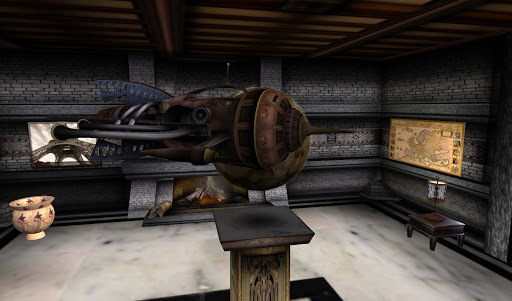 Taka continued to experiment with steampunk ideas both in SL and real life too. This is the first floor entrance to our amazing house. We spent a lot of time looking for furniture, but finally I helped nudge Taka toward my favorite color and he bought this lovely living room suite for us. I spent a lot of time working on the new garden, but despite my efforts to marry the two worlds of steampunk and Japanese style, it was a struggle. The other night, as quickly as steampunk had become part of our lives, Taka decided it was time to return to our roots. So, it was goodbye to our steampunk home but not goodbye to steampunk, and welcome home to the beautiful home Taka had began building for me back in April. We will have some challenges fitting all our things into “The April House” (I just named it) and we are still working with textures and alignments, but I am very happy to have my special house again. More on this soon. 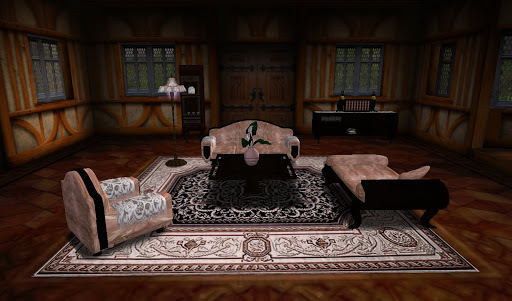 This entry was posted in Journal and tagged Homes & Gardens, Photography, Second Life. Bookmark the permalink.